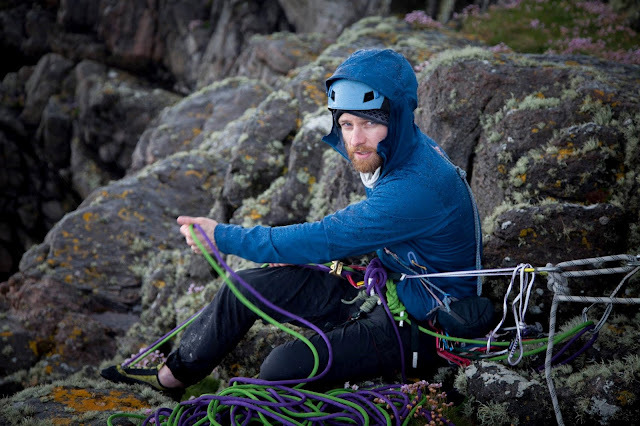 We recently had the chance to test the new Kinetic Plus Jacket from Rab. 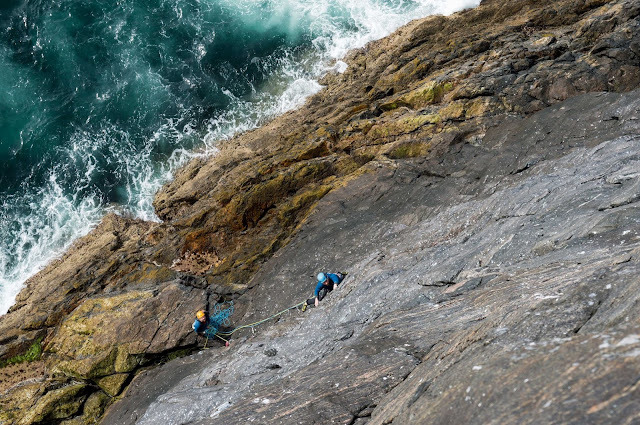 Our tester was able to put the jacket through its paces in a wide variety of conditions including a week of constant use climbing on the remote and spectacular sea cliffs of Mingulay. Straight off the bat, the first thing we noticed about the Rab Kinetic Plus jacket was the streamlined athletic fit. This is a jacket clearly designed to be worn close to the body with just enough room for base layers and a light mid-layer underneath. The jacket is cut trim around the waist with enough room in the chest, shoulders and arms to accommodate unencumbered movement when climbing, hiking, etc. The close fit is also present in the hood which is designed with a secondary layer of fabric under the articulated brim to create a seal around the forehead. This innovative feature allows the hood to fit securely without feeling tight or restrictive, easily withstanding gusts of wind and moving with your head. Notably, although designed as an under helmet hood, our tester preferred to wear it over a helmet which worked fine due to the stretchy fabric – although the inner fabric did catch on the helmet's headtorch clips which at least kept the hood in place but made it awkward to remove. The jacket also comes with 2 large hand pockets that sit above a harness, adjustable cuffs and a streamlined Velcro hood adjustment system, along with its own stuff sack. The Kinetic Plus jacket uses Rab's proprietary Proflex fabric. The fabric is soft to the touch with a significant degree of mechanical stretch – well suited to the jacket's athletic cut. Rab describe this fabric as "super lightweight stretch softshell with high levels of breathability and waterproofing". After using the jacket daily over the course of a week in all conditions ranging from soaking wet belays (see image above) to sun-baked rock, we can confidently say that the Proflex fabric lives up to Rab's claims regarding both waterproofing and breathability. Rain noticeably beads on contact with the outer shell, and our tester felt able to leave the jacket on during sunny spells without overheating during moderate activity (i.e. climbing). Although hiking uphill with a heavy pack in hot and humid conditions was a step too far - as would be the case with most (if not all) shells. With regard to durability, the fabric withstood a week of constant use coming into contact with sharp rock without any noticeable wear or damage. By comparison, some more traditional lightweight shells suffered from abrasion during the trip. The Kinetic Plus jacket doesn’t offer anything which you can't find in a variety of other jackets from lightweight windshirts, stretchy softshells and full on hardshells. However, what it does is take the best features of all three and combine them in one garment. So it allows the user to change the way they pack for the hills. Our tester commented that the Kinetic Plus jacket effectively negated the need to carry an emergency shell and replaced his usual windshirt with a more robust and comfortable alternative. Although at 320g the Kinetic Plus jacket weighs more than a superlight windshirt, the minimal extra weight is offset by its performance, doing the job of up to 3 jackets in one. Whilst not inexpensive at £170 RRP, we felt that the versatility and performance of the Kinetic Plus jacket merited the price tag. In our view, the Kinetic Plus jacket should be viewed as an investment piece which will undoubtedly see more use than your old hardshell which lives at the bottom of your pack or windshirt which can't withstand a shower. Although not necessarily revolutionary, the Kinetic Plus jacket is certainly a welcome evolution of hard/soft shell hybrids to be welcomed by casual users simply looking for a smart looking all purpose jacket for the hills as well as more dedicated climbers and mountaineers looking to refine their layering system. Overall, we loved the Kinetic Plus jacket with its attractive balance of smart styling and uncompromising performance and we can't wait to see what Rab do with the Proflex Fabrics next. Perhaps something for winter 2017? Things we liked: athletic fit; robust stretchy fabric; impressive waterproofing; versatility; changed the way we pack for the hills. Things we didn’t like: stuff sack should be integrated or attached to the inner pocket; zip felt stiff in use; helmet inner fabric can catch on helmet headtorch attachment points.